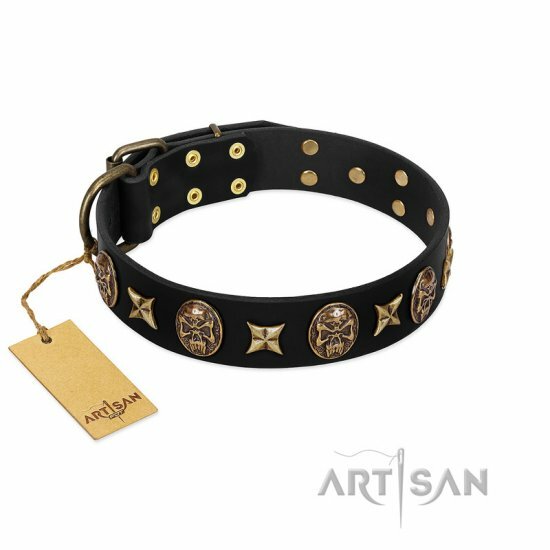 Point out your dog’s own style with an elegant black real leather dog collar from a designer collection FDT Artisan! A soft black leather dog collar is handmade of high-quality dog-friendly leather that is highly soft and flexible thus providing comfortable walking. A wide tear-proof leather strap and a rust-proof traditional buckle will stand huge pulling loads of your powerful dog. Old-bronze like squares and stars on a luxury black leather dog collar look very nice and add charm to your doggy. Moreover, all decorations are secured with reliable inner rivets protecting the adornment from falling out. You won’t know about dog’s skin rubbing or irritation due to rounded and polished edges. Connecting a dog leash to a welded D-ring provides you with better control of your lovely doggy. Being strong and super comfortable, a fancy black leather collar for a dog will please you every step you make and will give maximum comfort to your four-pawed friend. Hurry up to get a fantastic black leather dog collar with studs from the producer directly with the opportunity to get an ID-tag pendant for free! Strong and durable leather that becomes softer and more flexible during wearing. 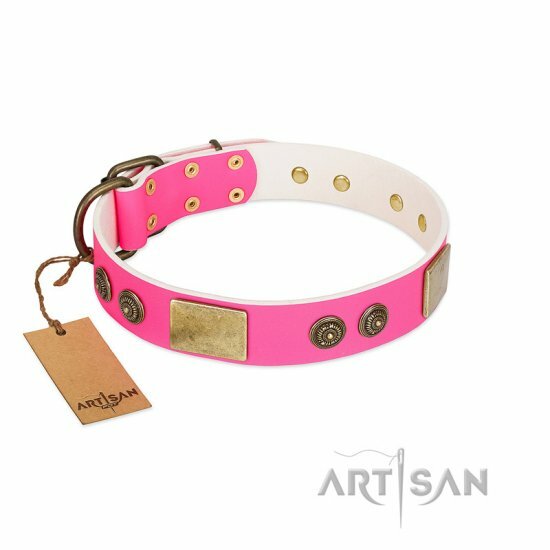 Elegant design with decorative brass ornaments adds power to your dog. A black leather dog collar in a nice brand box is a right and perfect gift idea for your lovely dog. Rustproof old bronze-like hardware of a leather dog collar allow to wear it for ages. Stars and skulls create a wonderful design on a genuine black leather.